Wedding invitations and favours that feature ribbons, pearls, and other fine finishing touches catch the eye of the Ornamentalist - after all, it's all in the details! When it comes to the Ornamental style, less is more - you don't want your wedding invitations to look like they've been gunned down in a beadazzler drive-by. 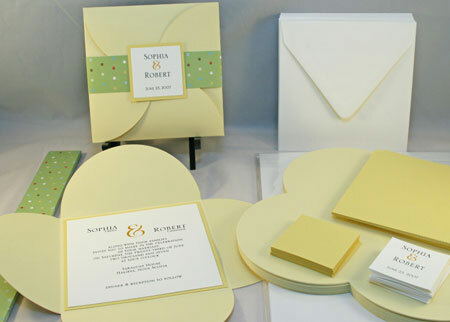 The best option for the Ornamentalist is to stick to one or two "add-ons", which may then become the signature style of your wedding invitations. Here are some typical and readily available examples. 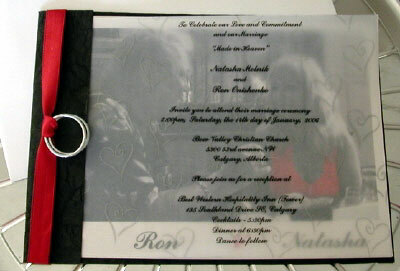 This invitation, named "The Red Dress", features a black and white photo of the couple overlaid with a red ribbon and silver-toned souvenir rings. Courtesy of Calgary, Alberta's With Your Touch. The "Paige" design comes complete with a cardstock seal displaying the couple's names and a polka-dot ribbon band to complete the pretty package. 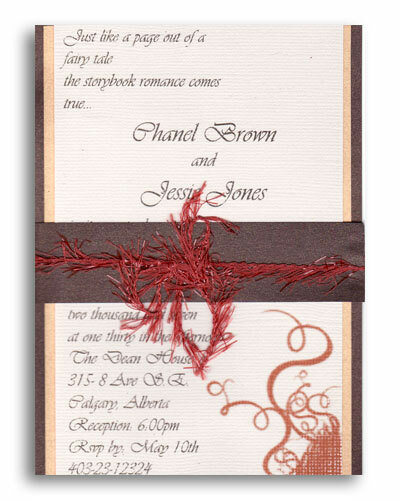 It's available as part of a do-it-yourself kit from also Calgary, Alberta based The Uncommon Bride. Featuring triple layers and a unique feathered ribbon, "The Chanel" is available in a variety of different colours, fonts and wording, courtesy of Powder Room Cards. The two-toned pink ribbon overlaying this elegant invitation shows what a difference a detail can make! We found it at Euphoria Designs.